Is This Aishwarya Rai Bachchan's Fanney Khan Look? 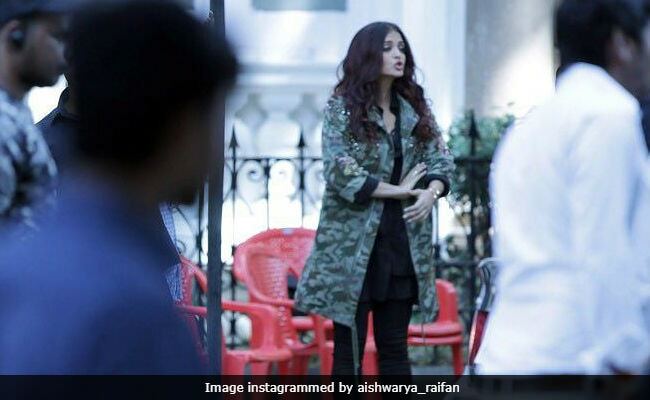 Aishwarya Rai Bachchan's look from her upcoming film Fanney Khan is doing the rounds of social media. A picture of Aishwarya Rai on the sets of the film leaked after a crew member met with an accident. According to a First Post report, Aishwarya was shooting at Mumbai's Flora Fountain area when "a motorbike crashed into a crew member while she was crossing the road." The filmmakers issued a statement saying that the crew member was given first aid and taken to the hospital for further treatment and she is "completely fine now." But the Internet is obsessed with Aishwarya's first look of Fanney Khan only. In the comments thread of a post shared by Aishwraya's fan club, people are concerned that Aishwarya's look in Fanney Khan is similar to that in Ae Dil Hai Mushkil. "I think this type of dresses and hairstyle, we have already seen in ADHM. Why repetition when there is so much fashion/style out there," wrote one Instagram user while others showed compliments for their favourite actress. Fanney Khan is reportedly the remake of Dutch film Everybody's Famous and it also tackles body-shaming issues. It is the story of an aspiring singer's (played by Anil Kapoor) relationship with his daughter and how a famous singer (Aishwarya Rai) makes a difference in their lives. Actor Rajkummar Rao also stars in the film, which is produced by Rakeysh Ompraksh Mehra. Fanney Khan will be directed by Atul Manjrekar. Aishwarya Rai was last seen in Ae Dil Hai Mushkil, in which she played the role of a poetess. She was paired opposite Ranbir Kapoor. Do you think that Aishwarya's Fanney Khan look is same to same as Ae Dil Hai Mushkil? Tell us in comments.